GlossyBox is quickly becoming one of my favourite boxes. Really! It is! I don't know what it is that makes it one of my favourites...the box is this beautiful powder pink colour and really good quality. Oh yeah, and the products aren't too bad either! HAHAHA. Unfortunately, there was a bit of a snafu and I didn't get a tracking number for the box, but GlossyBox had posted something on their Facebook page to let us know. When I picked it up, I couldn't believe how HEAVY it was - again! Last month's box was super heavy too. That got me really excited! Heavy boxes = full sized samples!!!! YIPPPEEE!!!! And as always, it's smelling simply delightful! I didn't get an information card this month with my box, so I'm going to wing it. First up is a FULL SIZED Professional Sebastian Volupt Volume Boosting Shampoo. WOOT WOOT!!! This shampoo contains cushioning particles to provide a volume boost and soft touch to your hair. It also contains natural bamboo extracts. It smells fantastic. Snaps for great smelling hair. 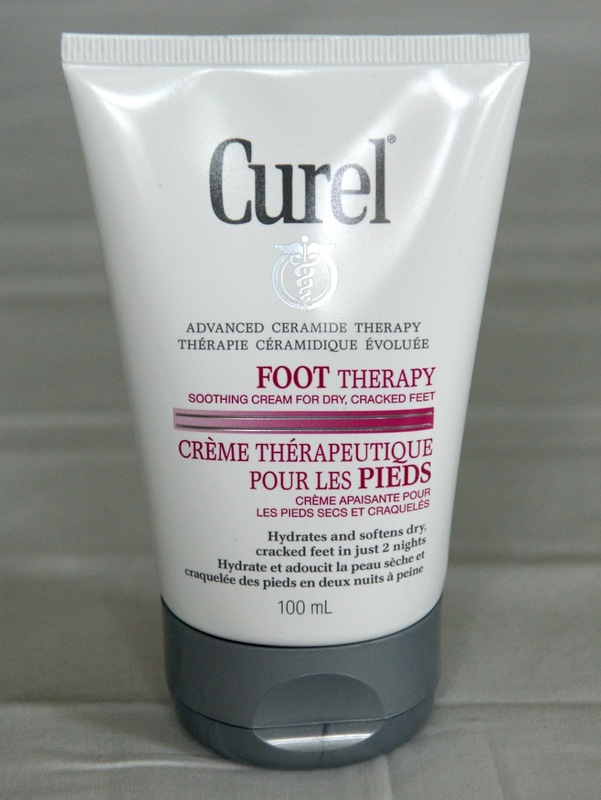 Next up is Curel Foot Therapy. 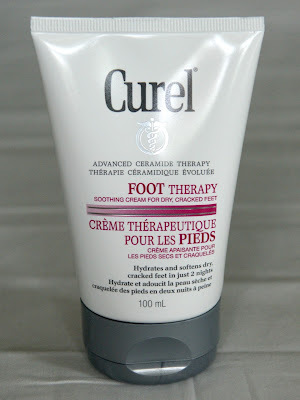 It is a soothing cream for dry, cracked feet. This doesn't look to be a full size, but it is a fairly good size (100ml). Perfect for travelling. It is infused with shea butter, coconut milk and vitamin E to help build a 24 hour hydration barrier. I'm happy to have it, but I doubt that it'll beat out my Rocky Mountain Soap Foot Butter (two applications and your feet are soft as a baby's bottom!). The next two products are probably the ones that I'm most excited to try. 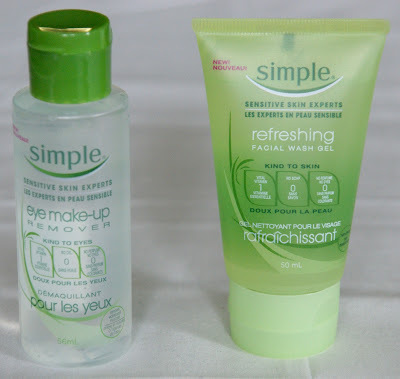 Simple Eye Make Up Remover and Simple Refreshing Facial Wash. I've been wanting to try out their products, but just haven't gotten around to deciding which one I wanted to try our first. So now, the decision has been made for me! They are pretty big deluxe sizes (once again, probably the same a travel size), so it'll contain enough uses for me to be able to do reviews on them. The last product is from BOXX Cosmetics and I'm assuming that it's a full size. A little about the company - Boxx Cosmetics is a Canadian cosmetics company where everything is designed and made in Canada. 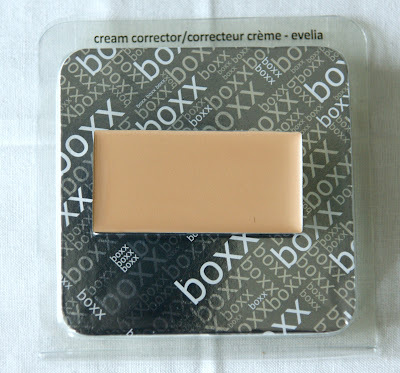 I received a cream corrector in Evelia (Medium shade with pink undertones. Best for those with light to medium skin). It might be a little dark for my skin tone. This cream corrector can be used as foundation or concealer and it's supposed to be able to cover all those little imperfections (including under eye circles, sun damage and broken capillaries). This is formulated without paragons, formaldehyde donors, phthalates, gluten (? - hey, I don't question...), animal derived ingredients and oils. One thing that seems odd about this is, is the packaging. It is minimalistic packaging (which is fantastic) but it also makes the assumption that you will have a magnetic case for it, as I think that it would be awkward to use in the plastic container it came it and probably would dry out faster because already, my plastic container isn't sealing properly) The value of this product (as per the website) is $24. The cream corrector alone covers the cost of the box ($15). What do you think of this box? Which item would you be most excited to try? I'm loving my May Glossy Box, very similar to yours. I'm very excited to try the Simple face wash gel and eye makeup remover. Do you know where to get those if I want to get some more, as I haven't seen it before. This was an awesome box! Guess what? I just bought a a travel set of the Simple products, I am sooo excited to see how they work. Oooh! I hope that you do a review on them! Great box! Simple skincare stuff is really nice, I haven't tried the makeup remover tho. 5/5? Thats awesome! I am super intrigued by the smashbox do-it-all product! I really like the concealer, it is sooo smooth and creamy. I agree that the packaging is a little odd, though. I'm waiting for the weekend to try it out (when I don't have to look perfect! :P) and I hope that it turns out all okay. I'm more worried about the shade than anything. I was most excited about the Simple products too! I know what you mean about the packaging for the boxx cream concealer. I was just fortunate that I had my UNII palette and was able to just throw it in there. I wonder what everyone else is doing with theirs if they don't have anything to put it in? Even though I personally don't subscribe to any beauty boxes, from what I've seen GlossyBox does seem to be the best! I've tried the Simple Eye make up remover and unfortunately my eyes were too sensitive for it :( it does a good job though although I have tried better. My HG concealer will always be the MAC Studio finish concealer in the pot or the Make Up Forever HD Full Coverage extreme coverage concealer in the tube. It's all I've ever used so far in my makeup wearing life, so it'll be interesting to see how this Boxx concealer holds up! I would LOVE to try the simple products... since I never tried any of them yet! Everyone keeps on talking about them! I would be most excited about the Sebastian Shampoo! I like your writing style and am joining on your blog! Totally agree about the awesomeness of this box. Great products this time! Hi, great products :) I have used quite a few simple products and the eye make-up remover is really nice to use. Sweet Delights Divalicious Sample box Review!